Cincinnati, Ohio- CET received a Special Achievement Award from the PBS Development Advisory Council in recognition of CET Arts. 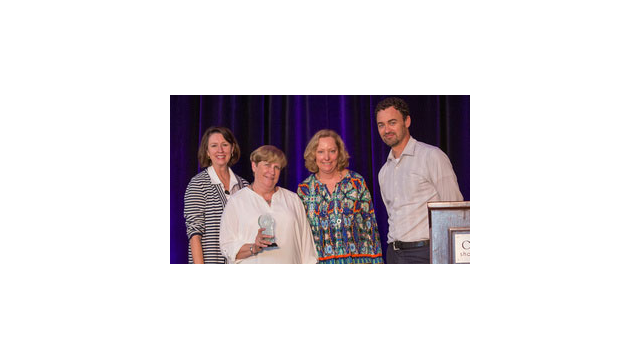 Betsey Gerdeman, PBS Senior Vice President in Development presented the award to Sue Ellen Stuebing, CET Chief Development Officer, Kay High, Associate Director of Development and Greg Schell, Corporate Support Representative on July 8, 2015 during the annual Public Media Development and Marketing Conference in Washington, DC. The special Achievement Award recognizes the development and success of CET Arts. The first 24 hour arts and cultural broadcast service of its kind in the nation, CET Arts premiered in February 2010. Thanks to generous support from individuals and foundations in greater Cincinnati, CET Arts has expanded its catalog of local programming to include two weekly series and arts Bridge, as well as a long list of special programs such as The World Piano Competition, The Cincinnati Boychoir,This Little Light of Mine, LUMENOCITY and many more. An increase in local programs along with a growing television audience and support from the local community all contributed to CET being recognized with the Special Achievement Award. “CET and ThinkTV are committed to bringing national, local and regional arts and cultural programming into homes throughout our region. The creation of CET Arts is a cornerstone of that commitment. We’re pleased that this programming service has been recognized, and we’ll continue to showcase the extraordinary arts and cultural life of our community on air and online,” said David Fogarty, President and CEO of CET and ThinkTV.